Will, a recovering heroin addict-turned-counselor for whom truth is a championed element to recovery, has a dark secret — shared with no one outside of his anonymous support meetings. Over twenty years ago, after an ultimatum from his pregnant ex-wife, Will was forced to assume a new identity and to fake his own death to get out from under his dealer and user-friends once and for all. Now Will is counseling Thea, a young woman who has been diagnosed with a pathological addiction to creating fake social media identities, and who founded a start-up company (“Alibis”) that created false internet identities for clients, many with suspect pasts. Thea’s addiction has landed her in rehab as a condition of her parole — after a plea bargain cut short a court case that would have put both Thea and Alibis on trial for a very high-profile crime. As Will works with Thea, the truth is put into motion on a collision course. Both Will’s, and his young client’s, secrets start to unravel … and reveal, at long last, the truth about Thea. This will be one hell of a tricky review to write, there is SO much I wish I could say but it would all be one gigantic spoiler and y’all know I don’t do that. Whatever you think this book will be about based on the description doesn’t even come close to what it’s actually about, it goes in many unexpected directions and just when I thought I knew where it was headed Impellizzeri would throw a huge curveball and knock the entire book on its head. It’s twisty, dark, shocking and so very satisfying! While Thea and Will are the two main characters this is filled with a supporting cast that all have questionable motivations as well. It’s the type of book where you should pay close attention to what’s going on and even then I really doubt you’ll be able to predict what’s coming next. The plotting is meticulous and super intricate, when things started to come together I was in awe, shock doesn’t even come close to explaining what I felt. One angle I absolutely loved was Thea’s addiction to social media, it was fascinating and so current. The whole thing was sharp, clever and very well executed, there were several head spinning revelations and the lies kept stacking up, when the truth about Thea (and everyone else!) was revealed I was stunned, what a surprising and memorable read. Huge thanks to the author and the Great Thoughts Ninja review team for my copy! Darn it, you hooked me! Another one I have to add! This sounds amazing Amy, thanks for bringing it to my attention, I must read it! Can’t help it, I want to read it!!!!!! I think you would like it Annie!! 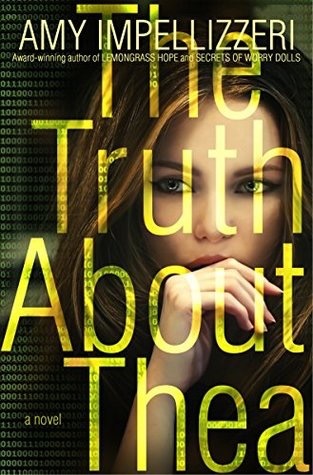 Check out the review of the book, The Truth About Thea, by Amy Impellizzzeri, as featured on the Novel Gossip blog.